This car is huge. In black, it looks like the transport of Triads in a Tartan Asian Extreme Thaikwando movie. Underneath it’s a hefty ladderframe chassis, solid rear axle 4x4 developed from the Ssangyong Musso, which became the Daewoo Musso. 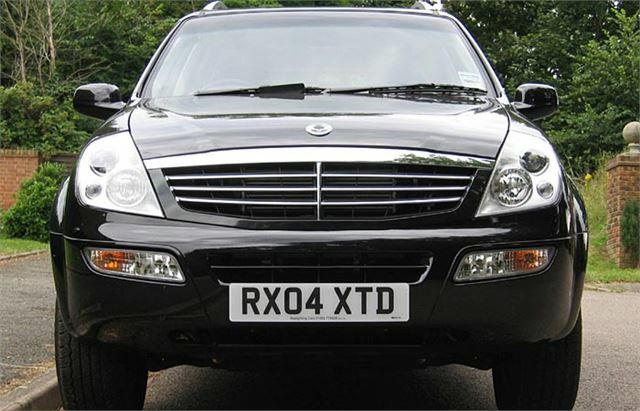 All very confusing even though Ssangyong remained in production right through the Daewoo debacle and has now re-established itself as the official UK importer of the Rexton. It’s obviously designed to supply a lot of status. The styling isn’t quite the way Land Rover would do it, but when you see Rextons in glass and chrome showrooms in places like Bangkok you can understand how they are trying to nick a chunk of the fat cat 4x4 market. All this is very important because if it doesn’t grab you that way then there is no point at all in buying a top-spec Rexton 270 SX XDI which is the subject of this test. 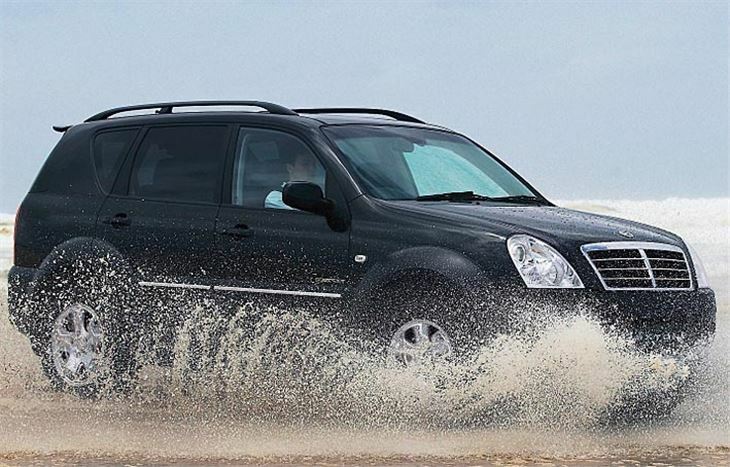 Adopting a completely different mind-set, the Rexton 290E Tdi does make a huge amount of sense to farmers and anyone needing a cheap, big, basic 4x4 to haul something heavy. Like a 3,500 kilo livestock trailer, horsebox, chrome caravan or mobile hamburger stand. The difference is the list price: just £17,499 on the road for a massive motor, the only gap in the spec of which is a lack of aircon. But back to my black mafiamobile. A ‘7’ in the model name means it’s a 7 seater, and the middle seats bi-fold easily to provide access to two minute midgets who don’t mind sitting on the floor with their heads on their knees. The mid row is very comfortable for three proper people, though piggy in the middle has to make do with a lap-strap. 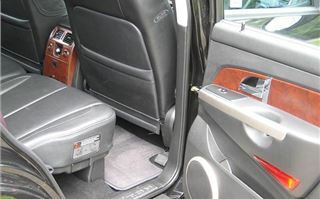 The front offers acres of elbow room. 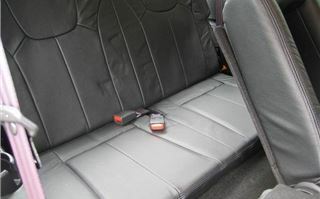 And all seats are upholstered in the same leather which once contained a cow. This is more than can be said for the ‘wood’, which makes no pretence at all at being anything other than plastic. Never more obviously a case of telling the ‘wood’ from the trees. 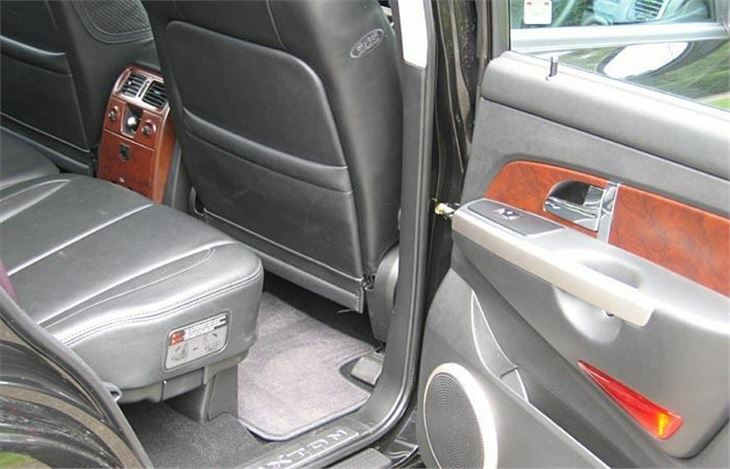 Climb inside, get going and first impressions are of a landyacht like the Range Rover Classic. 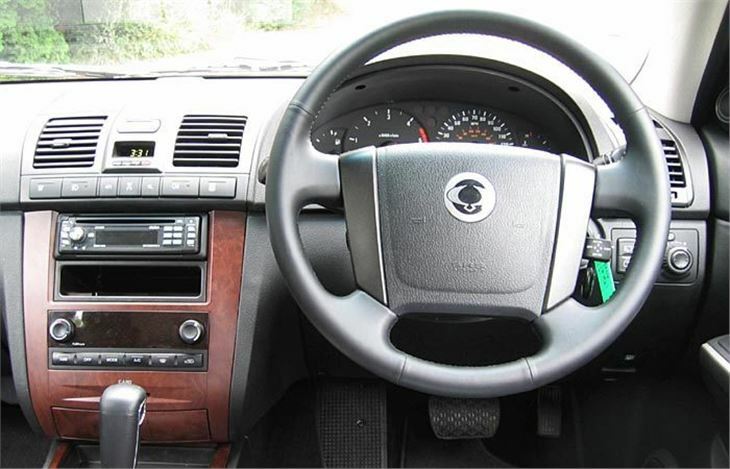 Like my house, steering is detached, and the gears slur aimlessly through what looks and feels like a Mercedes 5-speed box with ‘flop-tronic’ side-to-side manual override. Once you’re moving, however, it quickly changes up to 5th and stays there down to around 1,500 rpm, which is okay for economy and, usefully, the display tells you what gear you’re in even when you leave it to self-select. 70 in top corresponds to 2,250rpm, so that’s about 30 mph per thousand. Alarmingly the anti-hijack doorlocks snap closed at exactly 30mph, which assumes your hijackers will be Terminator standard 100 metre sprinters. Driving is actually quite pleasant in outer London because it’s very happy indeed at the sort of freshly imposed speed limits we now find round every corner and you don’t actually want to drive any faster. Then it falls to pieces in the outer suburbs and countryside where bumps send the wheels crashing and shimmying and the drivetrain can develop an unpleasant to and fro motion like (though nothing like as bad as) the Nissan Serena diesel. It doesn’t even absorb road humps. Though there’s no way you can chuck this thing about, cornering is neater than you first think it is and grip is okay. Certainly much better than a Nissan Patrol, though not even on the same roundabout as the VW Touareg 2.5TDI. And there’s a massive, colossal, pantechnicon-like blind spot, created by those colossal ‘D’ pillars at the back. I hadn’t realised this until I overtook a traffic jam caused by a Carina and got into the ‘wrong’ lane off a dual carriageway into a single one. Carinaman took great exception to this and, unbeknown to me, asserted his place on the road, totally invisibly to the left of my nearside rear wheelarch. It wasn’t until I wondered where the **** in the Toyota had disappeared to that I realised he and his wife were about to be annihilated by my gigantic 235/70 R16 rear tyre. So, having nowhere to go, I had to push pedal to the metal, leave him spluttering invective in a puff of black diesel smoke, and remember to adjust my nearside rear mirror downwards. Did I like it? Do I recommend it? Well, I got used to it. And if the Thai Triads decided to involve me in their business ventures, then I might consider a black 270SX as my motor. 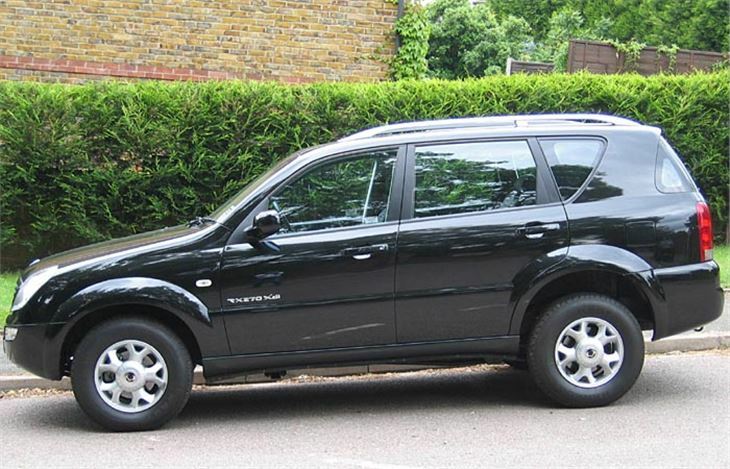 But, if forced to buy a big new 4x4 for the Surrey school run, I’d probably sell a hat or two on ebay and go for a 2.5 TDI Touareg instead. 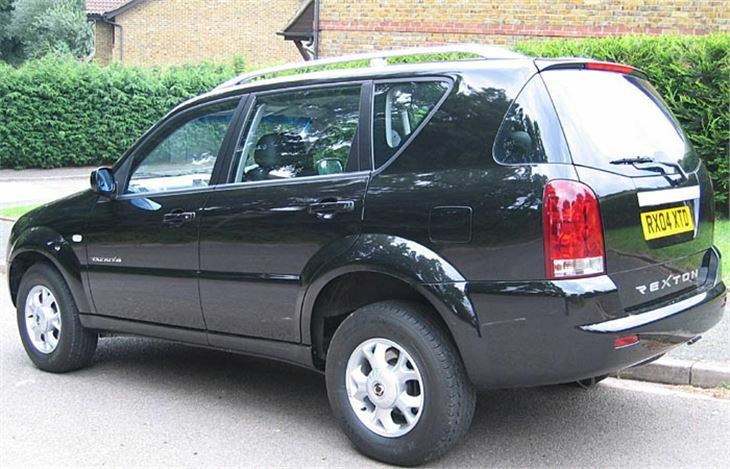 If, on the other hand, I fell into English events catering of the hog-roast variety, I’d be thinking very seriously about parking some of my hard-earned in a Rexton 2.9E Tdi.